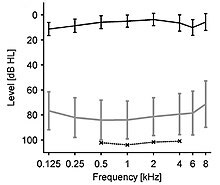 ↑ "Hyperacusis: An Increased Sensitivity to Everyday Sounds". American Academy of Otolaryngology-Head and Neck Surgery (in อังกฤษ). 2014-04-21. ↑ Barceloux, Donald (2012). Medical Toxicology of Drug Abuse : Synthesized Chemicals and Psychoactive Plants. Hoboken, N.J: John Wiley & Sons. pp. 457, 507, and 616. ISBN 978-1-118-10605-1. ↑ "Ciprofloxacin Related Hyperacusis, From FDA reports". 2017. ↑ Møller, Aage (2011). Textbook of tinnitus. Totowa, N.J. London: Humana Springer distributor. p. 457. ISBN 978-1-60761-145-5. ↑ Baguley, David (2007). Hyperacusis : mechanisms, diagnosis, and therapies. San Diego, CA: Plural Publishing Inc. p. 59. ISBN 978-1-59756-808-1. ↑ Granacher, Robert (2008). Traumatic brain injury: methods for clinical and forensic neuropsychiatric assessment. Boca Raton, Fla. London: CRC Taylor & Francis distributor. p. 181. ISBN 978-0-8493-8139-3. ↑ Desnick, Robert (2001). Tay-Sachs disease. San Diego, Calif. London: Academic. p. 25. ISBN 978-0-08-049030-4. ↑ Marc Fagelson, David M. Baguley (2018). Hyperacusis and Disorders of Sound Intolerance Clinical and Research Perspectives. Plural Publishing. pp. C15, C16. ISBN 978-1-94488-328-7. หน้านี้แก้ไขล่าสุดเมื่อวันที่ 14 กันยายน 2561 เวลา 13:42 น.